huestacean | Philips Hue control app for desktop with screen syncing. C++ with Qt Quick GUI. Philips Hue control app for desktop with screen syncing. C++ with Qt Quick GUI. Huestacean is a Philips Hue screen syncing app for Desktop and Android devices. It uses Philips’ new Entertainment API to sync the user’s screen with their lights with very low latency. Downloadable binaries for Windows, macOS, and Android are available on the Releases page. It ought to also be possible to build the source for Linux but this has not yet been tested, please read the README for instructions on building from source. This software can cause rapid flickering of your Hue lights that may trigger photosensitive epileptic seizures in vulnerable individuals. DO NOT use this if you are or suspect you are affected by photosensitive epilepsy, or are otherwise photosensitive, epileptic, or suffer from seizures generally. Cease use immediately and consult a doctor if you suffer from any seizure symptoms, which may include lightheadedness, altered vision, eye or face twitching, jerking or shaking of arms or legs, disorientation, confusion, or momentary loss of awareness. A Gen2 bridge is a must. Your bridge and lights should also be using the latest firmware. Use the Philips Hue Android or iOS app to update the firmware. At the moment this software can’t create entertainment groups. You need to do this in the Hue app. 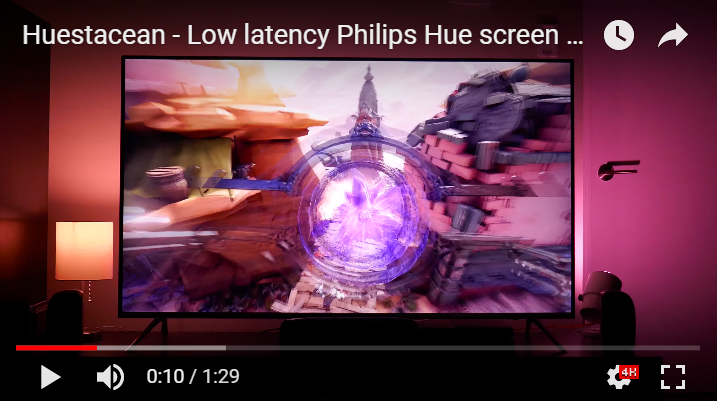 Philips has a video describing how to do this on the Hue Youtube channel. The Lightstrip Plus is by far the best light I’ve found for this. 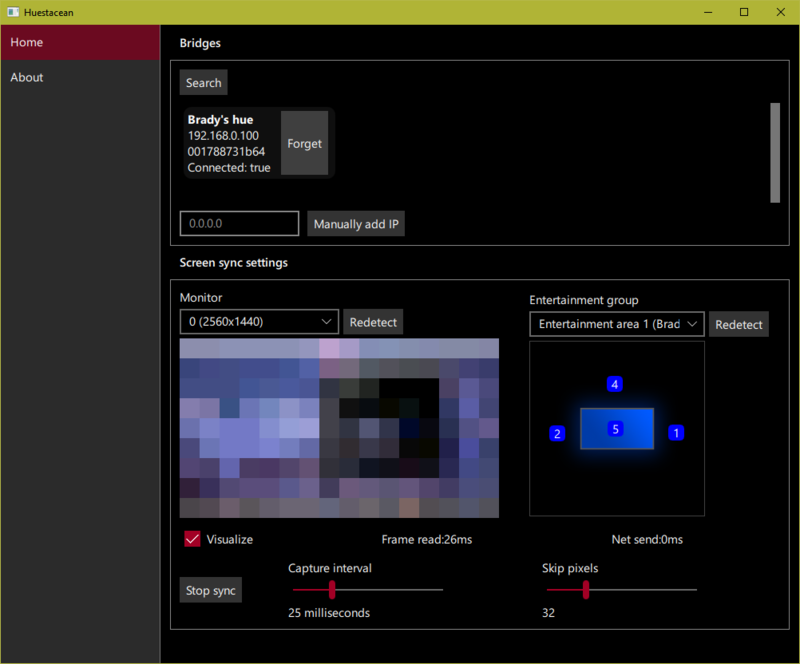 It has a wide color gamut, and it dims to a super dark state before it turns off completely. My Gen 1 lights are still pretty bright at their dimmest. This can be a problem when syncing the lights in a darkened room. For the best experience, I’d suggest using or more lights behind or to the side of the display, in front of you and within the central cone of vision. Rapid changes in lights behind or to your side are likely to be more distracting and annoying than they are actually enjoyable. The video above is more lights than I actually use this with; usually I only have the one lightstrip behind my TV syncing. Only (64-bit) Windows 8 and 10 are fully supported as the application uses the IDXGIOutputDuplication API which is only available from Windows 8 onwards. This allows the application to capture almost anything, including fullscreen games, with extremely high performance. If someone else is interested in working on Windows 7 support I’d welcome PRs, though. If you have a Hybrid GPU setup (some laptops, convertibles, etc. ), make sure you run Huestacean on the Integrated GPU, not the Discrete GPU. Only supported on macOS 10.7+ (uses AVCaptureScreenInput). Performance may be worse than Windows and Android. Download the .app from releases and run it. So far it’s only been tested on 10.11.6 on an old Macbook Pro. Build from source. See the README for more information. Performance may be worse than other platforms. Has not been tested on any real hardware older than Android 7.0, although it has been tested on 5.1 on an emulator. Turn off battery optimization on the app or Android will eventually suspend it while it’s in the background! Works just great on my old Galaxy Note 3 (with Lineage OS), which is more than four years old; I can streami Youtube and you couldn’t tell the difference from when I run it on my PC. Will not work in Netflix and other video apps that tell Android they’re showing “secure” content. Xposed’s DisableSecureFlag module can bypass this but don’t install that unless you actually know what you’re doing and how to recover from a boot loop. You could hose your device, do this at your own risk. Also mind that this allows other screen recording software to record other “secure” apps like banking apps. Use the repository’s Issues to report bugs or other problems. Refer to the LICENSE file for license info. This software makes use of open source software under various licenses, which may be found in the third_party_licenses directory. huestacean is maintained by BradyBrenot. This page was generated by GitHub Pages.